New Jersey’s state pension fund is trailing most of its goals, which is not helping it bridge its wide funding gap. 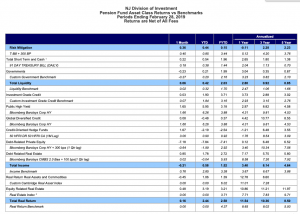 In its most recent monthly report, the New Jersey’s State Investment Council revealed it had not only failed to return 3.68% over the past year, but also that the $76 billion pension fund has only achieved two of its longer-term custom index requirements. That would be the 10- and 20-year benchmarks. The fund returned just five and 39 basis points above its 10.18% and 5.46% goals, respectively. Plus, the fund is currently above its year-to-date target, by 32 basis points. But it is sagging elsewhere. The fund’s three- and five-year returns are 39 and 10 basis points below the 10.37% and 6.52% targets, respectively. New Jersey’s State Investment Council is two-thirds into its current fiscal year, which ends in June, and has so far only achieved 1.67%, slightly more than half of its expected 2.89% policy benchmark. 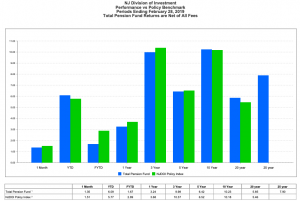 The fund’s assumed annual rate of return is 7.5%. Considering the state is also 31% funded, things are looking grim for New Jersey in 2019. That’s not to say it hasn’t had its share of good fiscal years—some, such as 2018 (9.6%), 2017 (13.07%), and 2014 (16.79%), were great. Others, such as 2016 (-0.93%), 2015 (4.09%), and the dismal 2009 (-15.49%) and 2008 (-2.61%), were not. Stocks have been mostly good during the non-crisis periods, but have also waned in the past year to due volatility, especially troubling in non-US developed and emerging markets. In the US, the fund bets on tech: Apple, Alphabet, Microsoft, and Facebook are top-weighted among domestic equities. Venture capital investments have done fine, as have private equity strategies, which are not included in February’s investment summary (they are reported on quarterly). Debt-based moves have been OK with the exception of the past year. Real estate has also been decent. That leaves the plan’s equity-oriented hedge funds, whose picks have underperformed consistently with the HFRI benchmark in the one-, three-, and five-year periods. They’ve been good over the 10-year period, though. It’s not just hedge funds that are to blame. Government contributions have lagged. 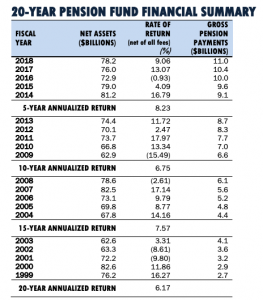 Since 1999, annual payments have only risen from $2.7 billion to last year’s $11 billion. Gov. Phil Murphy’s administration wants to pump $3.2 billion into the pension plan, which would only cover about 60% of what actuaries have said would help restore its funded status. Murphy’s 2020 budget proposal suggests increasing it to $3.7 billion, but that would only bring it to 70% of what actuaries want. If the state’s contributions trudge along that sluggish, the fund won’t get the full actuarial amount until fiscal 2023. New Jersey’s public pension plan is one of the worst-funded in the country. A mounting deficit and a future downturn could place the fund into insolvency. The pension fund’s asset mix is 58.31% global growth strategies, 19.75% income, 8.72% real return, 6.07% liquidity, and 4.81% risk mitigation. Targets for those classes are 56.25%, 21.50, 8.75%, 8.50%, and 5%, respectively.